Knopf Books for Young Readers, 9780307931818, 40pp. Libby's great aunt, Lobo, is from Mexico, but the United States has been her home for many years, and she wants to become a U.S. citizen. At the end of the week, Lobo will say the Pledge of Allegiance at a special ceremony. 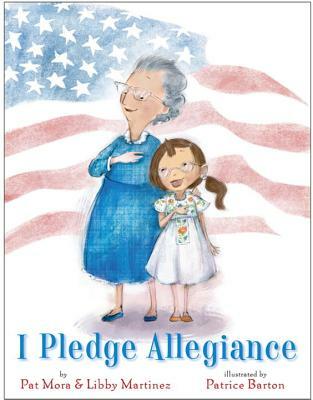 Libby is also learning the Pledge this week, at school—at the end of the week, she will stand up in front of everyone and lead the class in the Pledge. Libby and Lobo practice together—asking questions and sharing stories and memories—until they both stand tall and proud, with their hands over their hearts. Award-winning PAT MORA's books include Tomás and the Library Lady and Doña Flor. She is an honorary member of the ALA, the highest honor the association bestows on non-librarian members. LIBBY MARTINEZ has worked in the Texas political arena, has served as the Director of School and Community Partnerships at the Philadelphia Zoo, and is the founder of a strategy consulting practice. She lives with her husband in Colorado Springs.